You know autumn's arrived in the Texas Panhandle when you see the first signs for the Tri-State Fair & Rodeo pop up around town. That's quickly followed by a rainy day (it ALWAYS rains fair week) and then...the parade!! Normally the fair feature I most look forward to is food, specifically a smoked turkey leg big as my head. I don't know where the giant turkeys come from year after year, but they keep coming and I keep eating their lower extremities. This year, however, I had a different fair feature to look forward to. 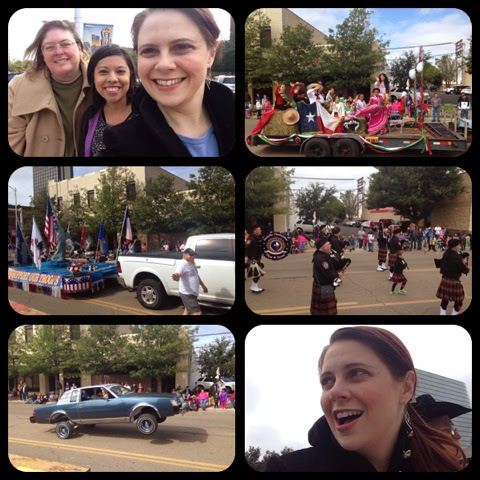 This year I judged the parade! Let me tell you, the view from the judges' stand is fantastic. The pressure of making a decision is not as nice, but the category I judged was thankfully a three judge category. Overall I had a great time. It was a fabulous parade; I heard many people say they thought if was one of the best yet. And there's a chance I'll get to judge again next year! Hmm. Wonder if I can work the Tri-State Fair and Rodeo into a future Undead Bar Association book. Maybe. For now, I want my turkey leg.